Poor Rick Springfield. He must have thought he struck gold when he was cast in Ricki and The Flash opposite the doyenne of American movies, Meryl Streep, in a film directed by Jonathan Demme and written by Diablo Cody, Oscar winners all. For the frosting on the cake, the supporting cast includes Streep’s daughter Mamie Gummer, Kevin Kline, and Broadway diva Audra McDonald. This should have been another high point to Springfield’s career, at least as satisfying for him as his soap stardom on General Hospital and his 1981 number one, Grammy-winning hit, “Jessie’s Girl.” With all of the talent involved, Ricki must have seemed like a can’t-miss. But, man, does it ever. Springfield has nothing to be ashamed of. He is one of the best parts of the film, delivering an effective performance and providing the movie with a sorely needed dose of charisma. 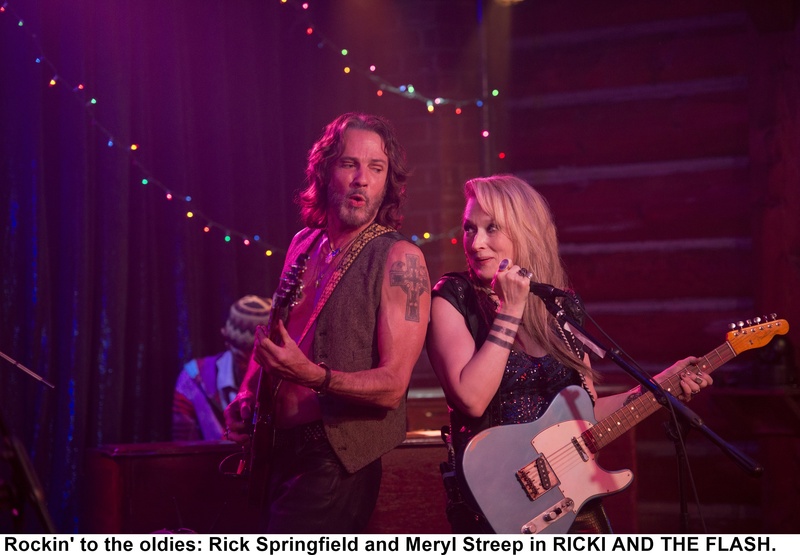 He plays Greg to Streep’s Ricki, her guitar player and lover that she takes for granted both on stage and off. Once upon a time, she was apparently an upper-middle-class wife and mother in Indiana, but gave it all up to pursue rock stardom in California. Now 60-something, she’s estranged from her kids and ekes out a bare-bones income as a grocery cashier and lives for the nights when she sings covers at the bar where she and the Flash are the house band. Despite the fact that her kids can’t stand her, her ex-husband Pete (Kline) gets the bright idea to fly her out to Indiana to deal with their daughter, Julie (Gummer), who has moved back home and sunk into depression after the break-up of her marriage. His wife, Maureen (McDonald), is away and he doesn’t feel equipped to handle Julie. That brings Ricki back into her family’s orbit and eventually to her son Joshua’s (Sebastian Stan) wedding. And none of it seems real. Not the manufactured family relationships or the ersatz family trauma or character behavior at odds with the real world. (Greg asking if the drinks are free at Joshua’s nuptials is one small example. Surely, even an aging, down-market rocker is familiar with the concept of an open bar. He’s been to weddings. He’s probably played a few and been a groom himself a time or two.) Most of the time, Ricki and The Flash plays like an overlong sitcom of the type that undercuts its tacky humor with sentimentality.